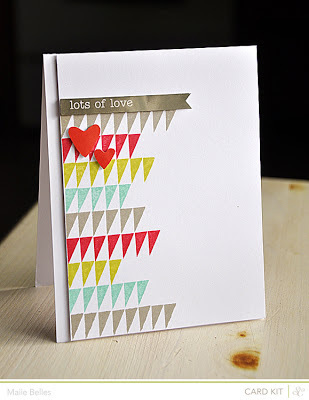 This card features a pretty color combo inspired by the pattern paper strip and enamel dots. 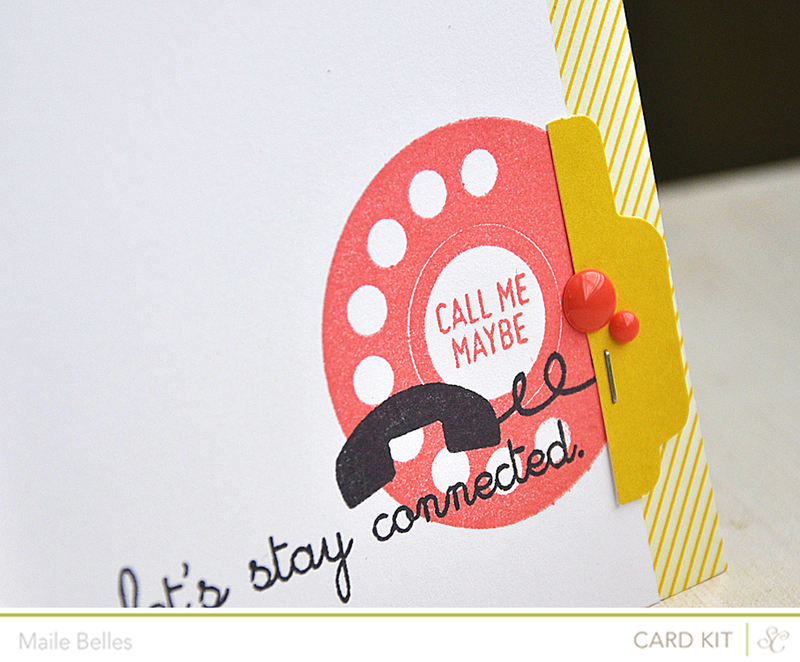 I just love the layered look of the sentiment and receiver stamped over the dial. Love the pattern on this paper! 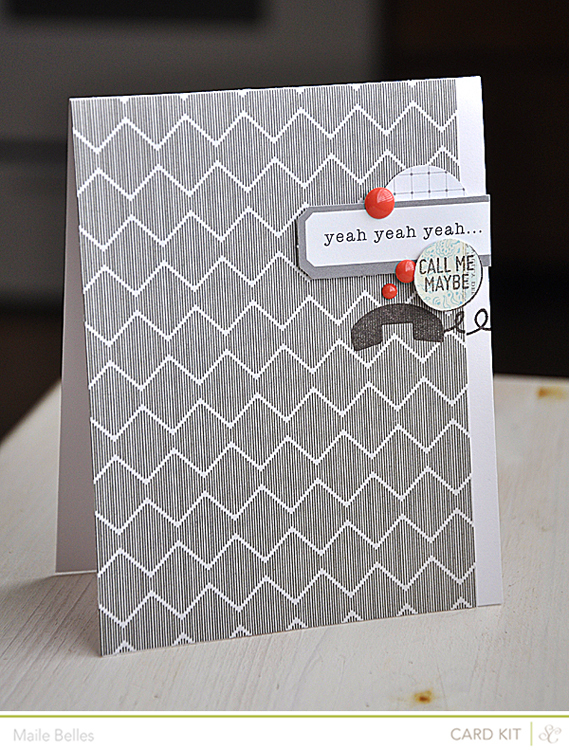 I wanted it to be the star of the show, so it took over the front of this card. As to not distract too much from it, I layered a group of fun Front Row card kit elements into the top corner. I love how the berry colored enamel dots stand out against all of the neutral colors. The circle at the very top is actually a label turned over to reveal the pretty pattern on the underside. 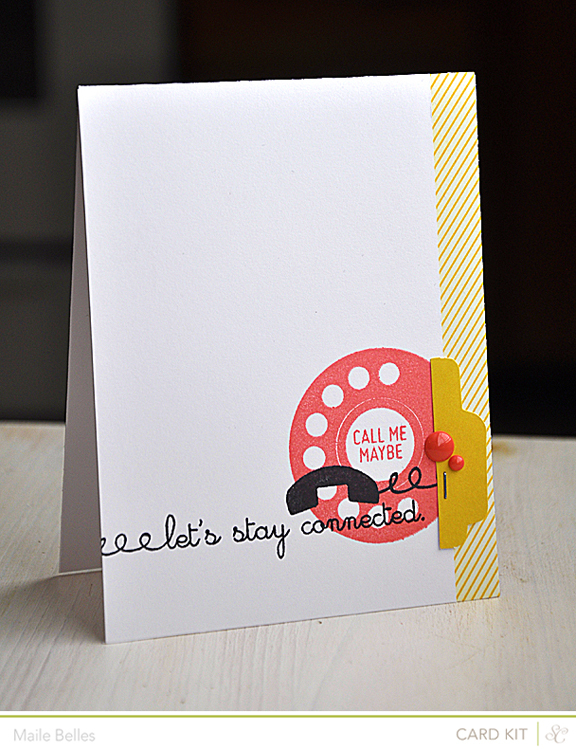 The focus of this card is definitely the fun trio of phone dials. 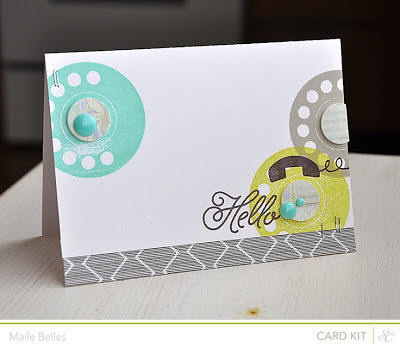 I punched a few pattern paper circles to embellish the centers, I love how they add a subtle pattern to the solid stamped images. Here's an ultra clean and modern mini card and coordinating envelope set. I turned over a couple of the labels to reveal the cool grid pattern on the other side. 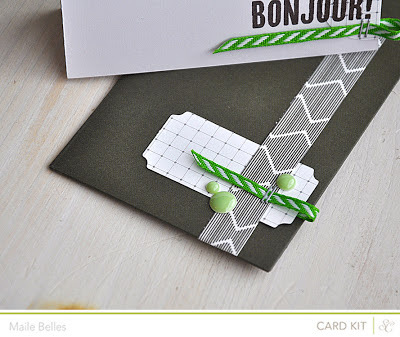 On the envelope, the ribbon was stapled into place onto the label and pattern paper strip before adhering all to the front of the envelope with adhesive. Hello all!!! So excited that you could join me. Today is a very special occasion, because a few friends and I are celebrating the amazing Julie Ebersole's 50th birthday! Julie is such a dear and so young at heart. I've had the honor of meeting her in person twice, and honestly... I still can't come to grips with her true age, to me she is such a fun loving youngster! I pulled out an old Hero Arts tried and true favorite stamp set of mine... Feathers. 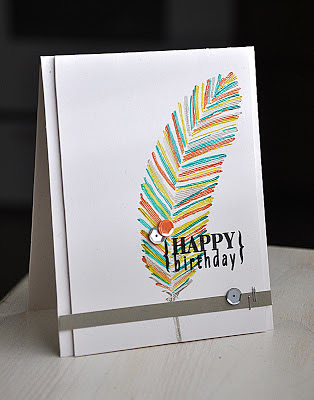 I began this card by stamping a sentiment from the Circles stamp set in black ink and then stamped the feather in Versamark ink (embossed in clear) directly over it. Added a few stokes of Mister Huey's (using a paint brush dipped into the mister bottles) over the embossing. Studio Calico Mister Huey's used... Audrey, Doris, Lucille and Pinstripe. Then finished the card of with a strip of Hero Arts wet cement layering paper (stapled into place using a Tiny Attacher) and then finished the card off with a few sequins. Once again... A huge Happy Birthday to my dear friend Julie and thank you for stopping by. 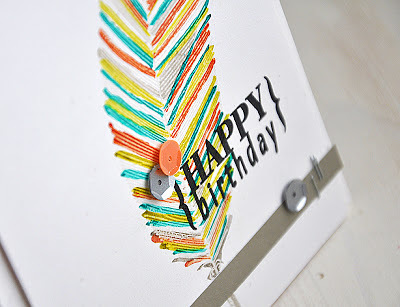 Now be sure to continue the birthday blog hop and stop by Jessica Witty blog for even more birthday celebrations! These first two feature the Front Row card kit only. There you have it... I hope you've enjoyed! 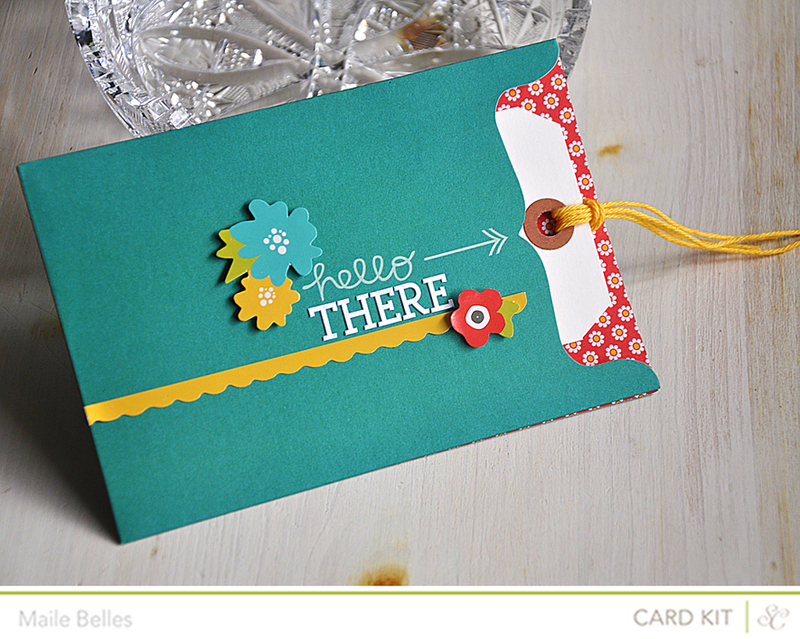 Find more of my sneak peeks via Instagram... mkbelles. :) The release is just around the corner! I'll be back just after that with the full reveal. Studio Calico - January Block Party Kits Revealed! This card is my Block Party card kit only card. 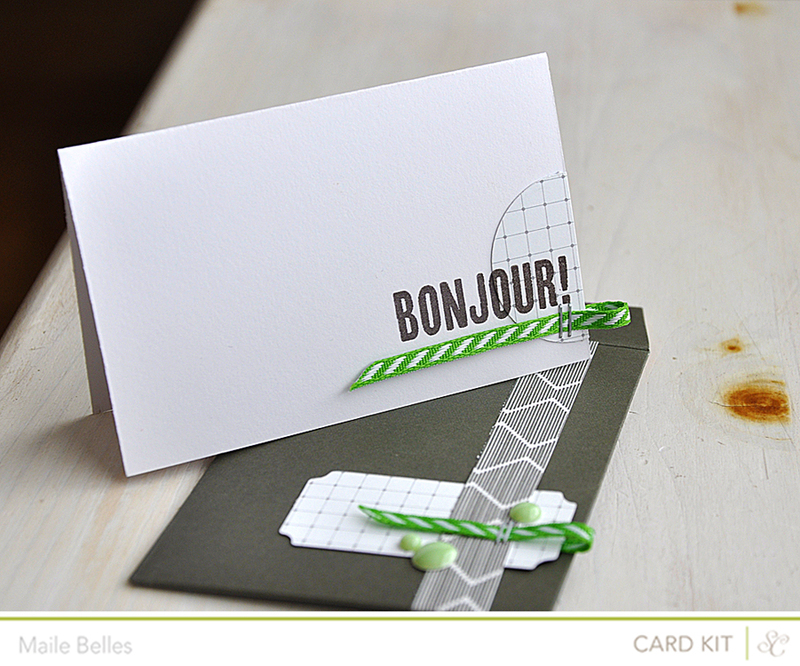 It features a few grouped greetings to let someone know you are thinking of them. 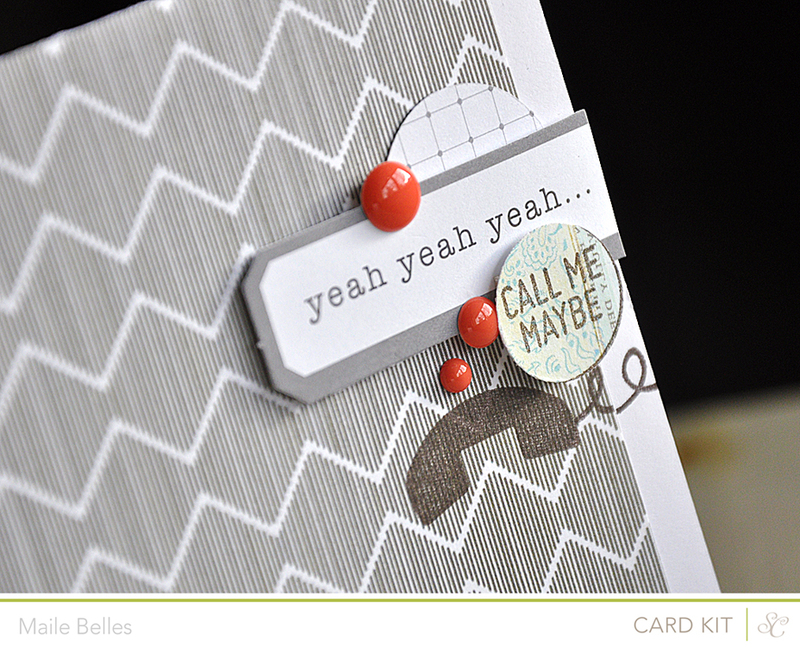 I just had to utilize this fun pocket from the Block Party card kit. And the sticker sheet from the Pioneer Drive add on made a perfect match! 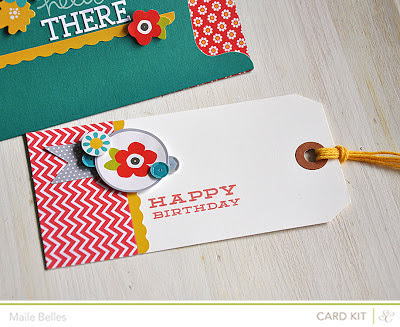 Inserted into the pocket is a festive birthday tag made to coordinate. 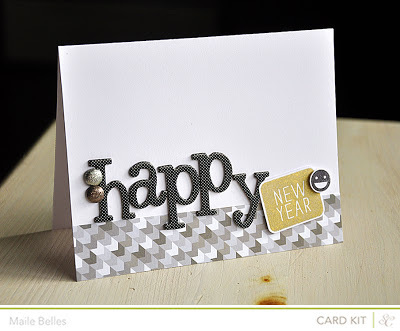 Here's a festive New Year card! 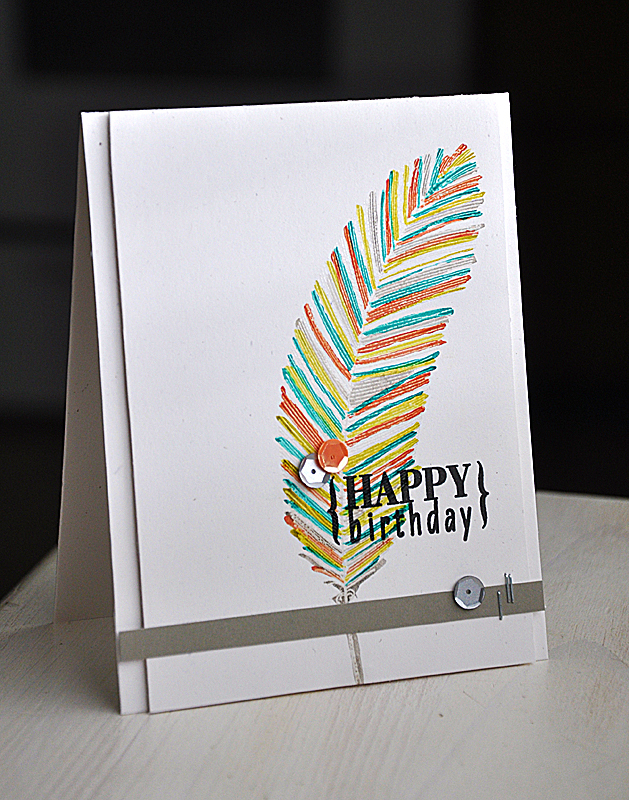 Made using elements from both the Block Party card kit and Pioneer Drive add on. I just love these polka dot Thickers and I couldn't be more happy to put them to good use. I went for a neutral and metallic color combo here, by incorporating glittered brads and a gold stamped sentiment. Seemed fitting for the occasion. The inspiration piece for this card... that small floral tab beneath the grouping of elements (it's one of the stickers from the Pioneer Drive add on). 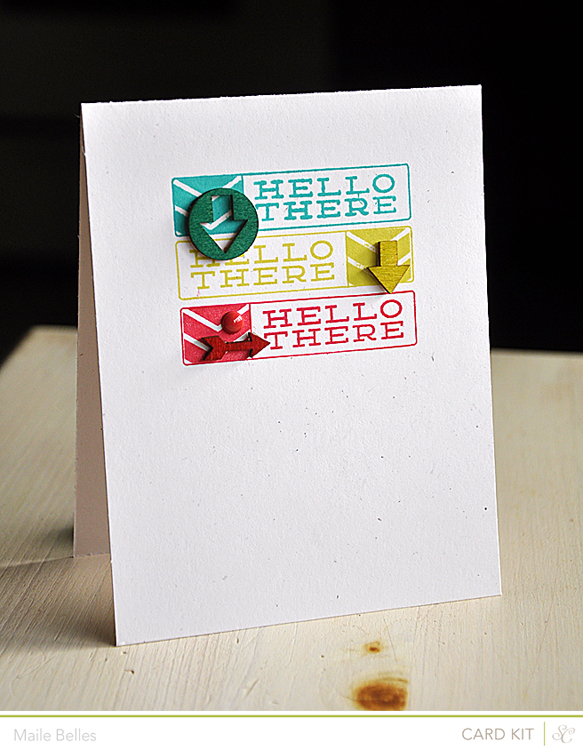 I just love how these bright colors pop against all that lovely white space. 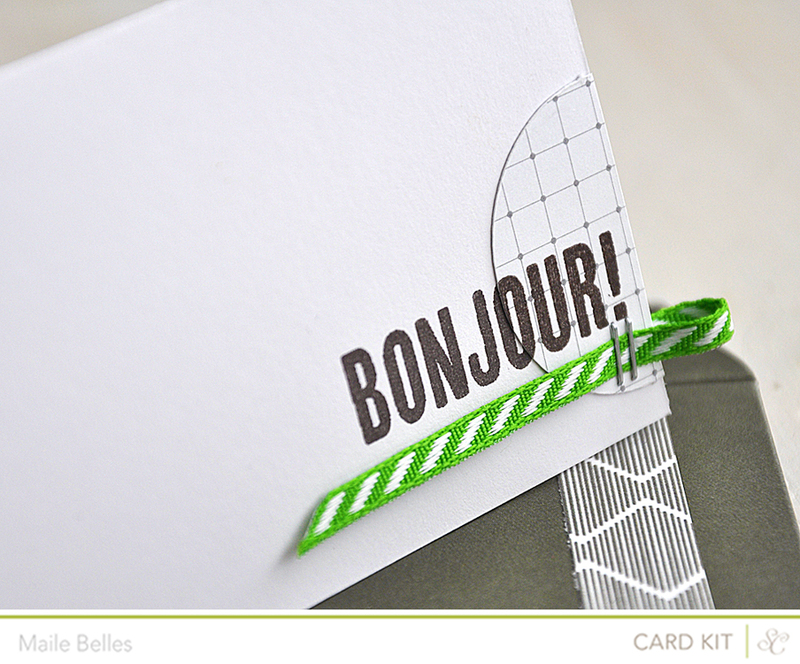 Oh, and that washi from the card kit is awesome! It's quite amazing what one can achieve using a single tiny stamp image. This little triangle piece is from the Pioneer Drive add on stamp set. 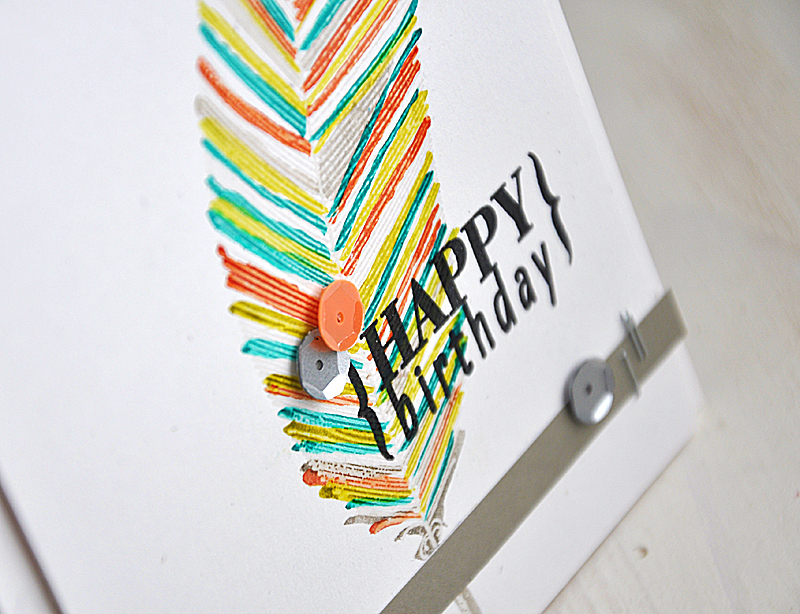 I stamped a number of colorful rows and then topped the card off with a few sticker elements. A pocket full of love! 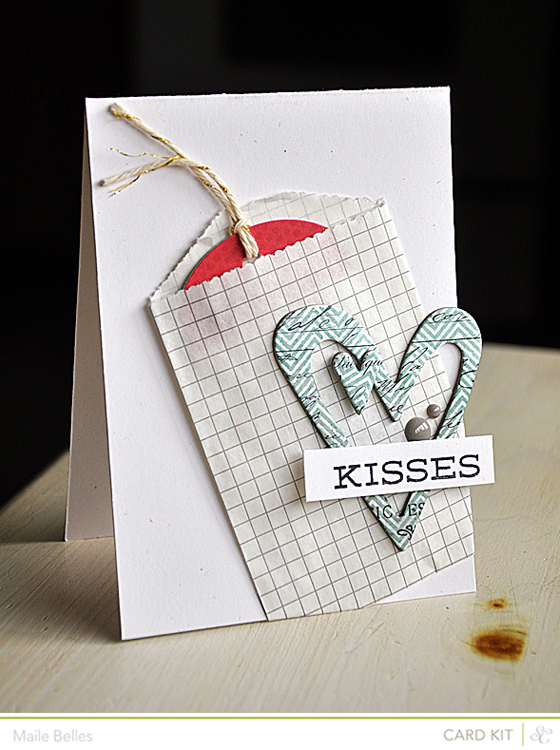 Here's a loving card that I made with my hubby in mind. 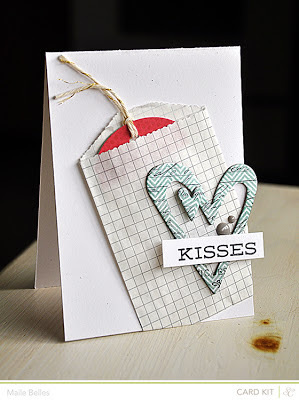 Using a grey grid bag from the Pioneer Drive add on and elements from the Wildberry Court add on to create a masculine themed love card, perfect for Valentine's day. 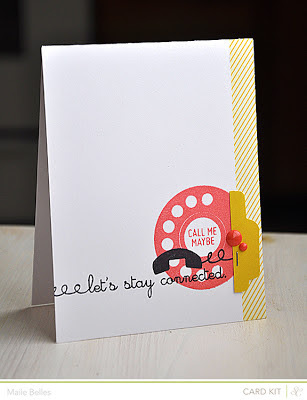 Clean and simple is this one layer card. 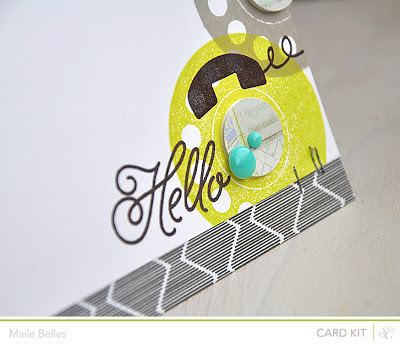 Using the Block Party card kit stamp set... 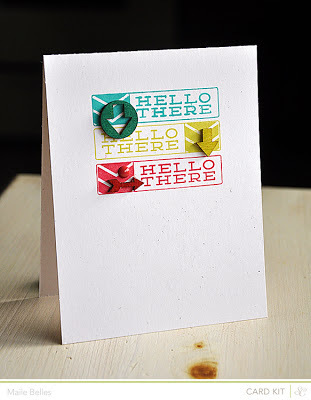 I stamped a few sentiment boxes in a trio of fun colors. Then finished the card off with a number of perfectly placed embellishments from the Wildberry Court add on (after inking some of them up using the coordinating ink pads of course). 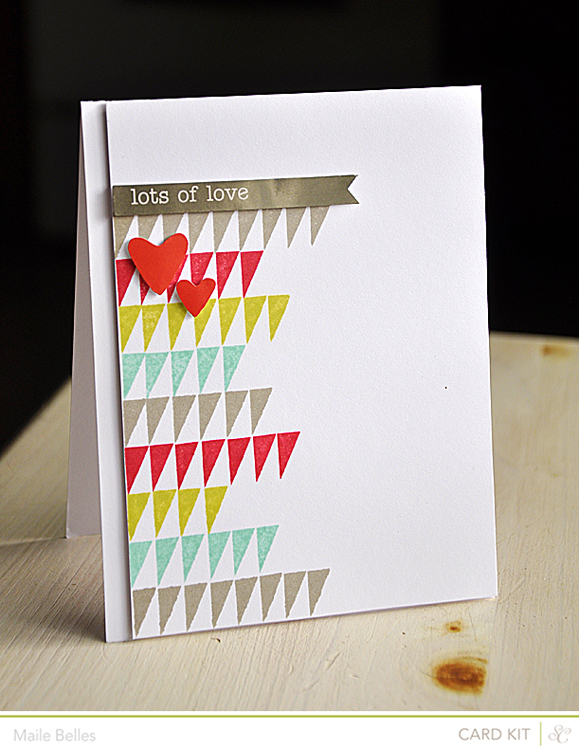 Here's a pretty little card, suitable for either a wedding or Valentine's day. 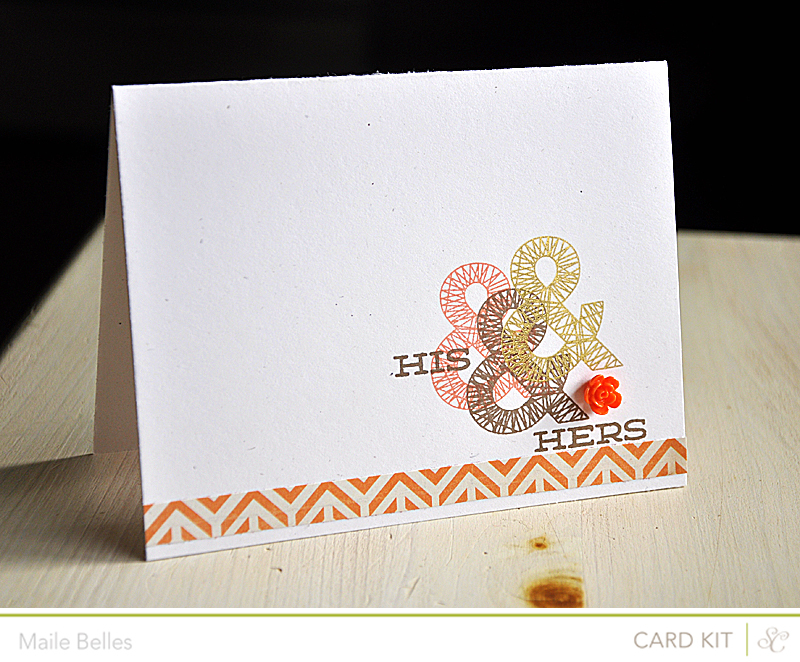 The focus of the card is the ampersand. I am so in love with this image! 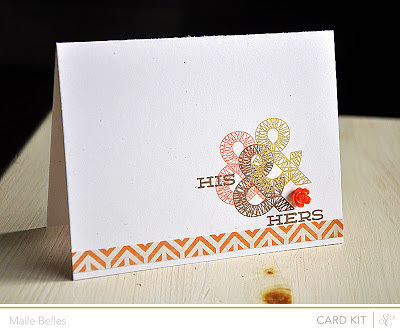 I stamped it three times using melon, brown and gold inks. It's such a pretty color combo. 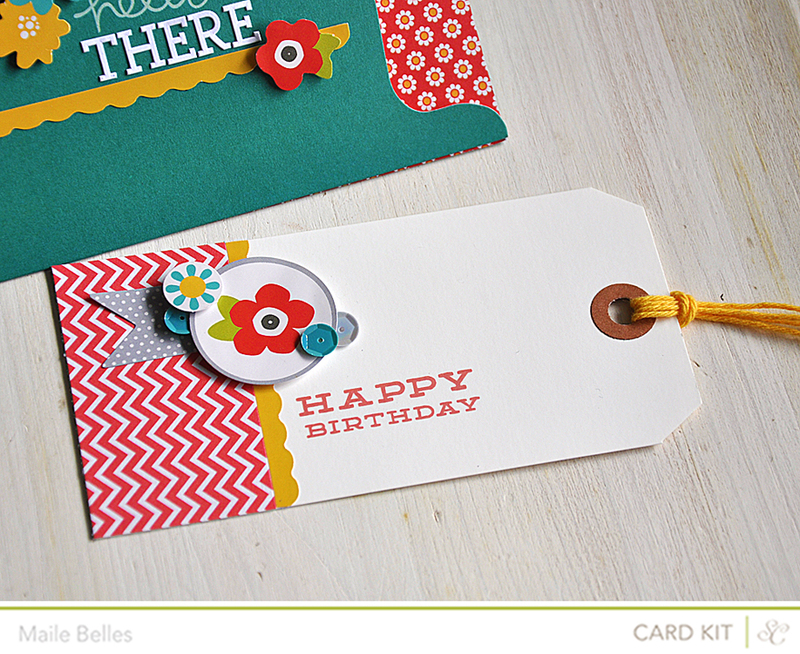 Then finished the card off with a strip of pattern paper and a flower. All elements are from the Wildberry Court add on. Arrows, arrows and more arrows. 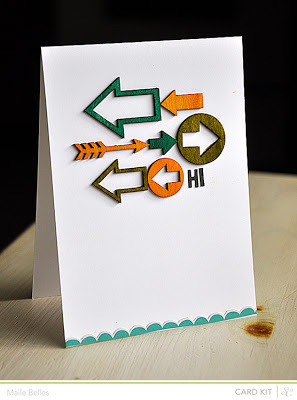 I inked a few Wildberry Court add on arrows using an assortment of ink pads. 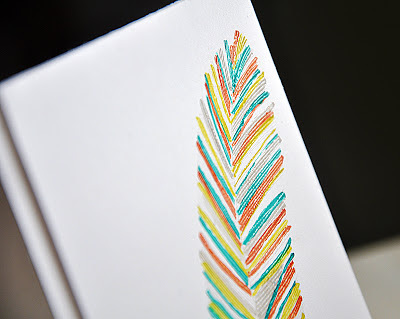 Simply pressed each one into the ink pads, let them dry and then attached. 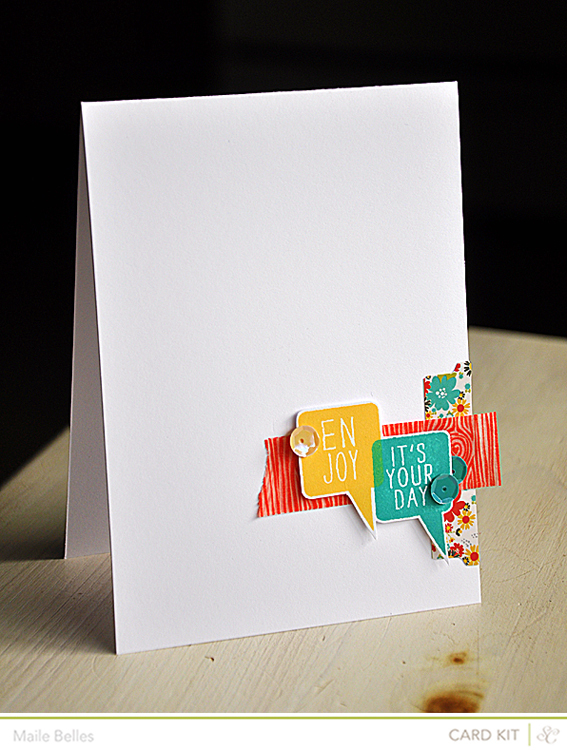 Finished it off with a simple sentiment and a scalloped edge, elements from the Pioneer Drive add on.